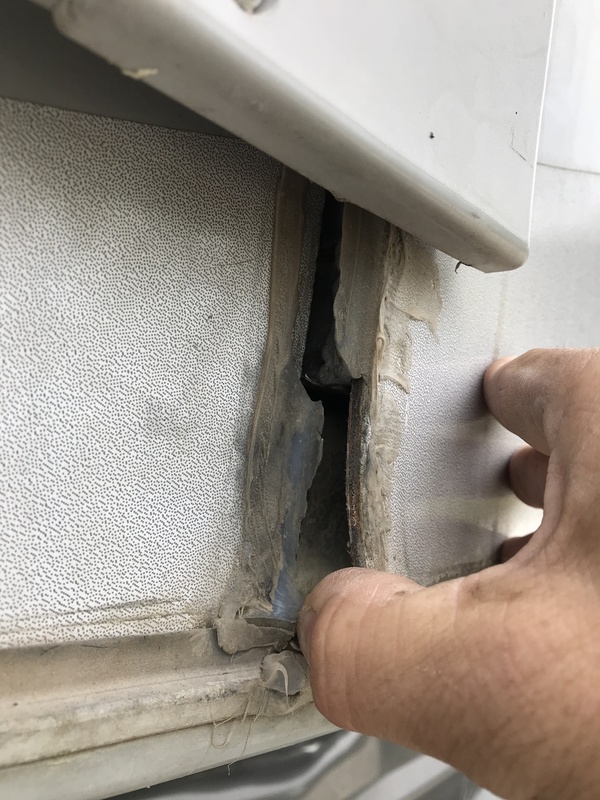 Last year when we were in Utah, Lee noticed a little separation in a seam of one of our side panels in the front right of our RV. The separation was only noticeable when we were hitched, and since we were in the middle of our time off we had an important decision to make. Do we stop everything and have it looked at or continue on and monitor the problem? We chose to continue on, but that separation really bothered Lee. 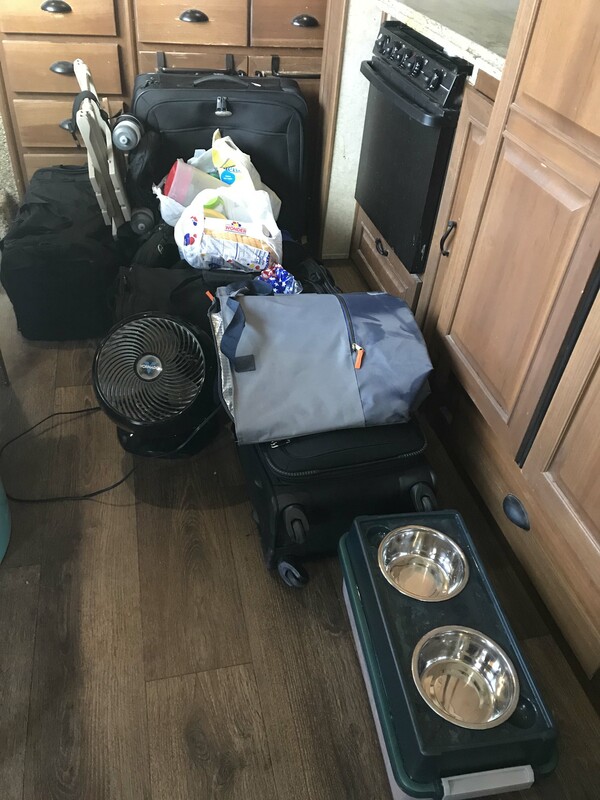 During the next five months we were stationary at Timothy Lake, and when we eventually did move the RV, it was only down to Texas where we only moved a couple of times in a four month period. The separation continued to widen, and by March it was wide enough you could stick your fingers in it. It also appeared that a weld was broken, although this was quite a bit harder to see. At this point we knew we needed to do something, so when Lee picked up some work in Phoenix near the end of March we thought it would be the perfect opportunity. Originally I thought about dropping it off myself and staying with Lee in the hotel, but I really wanted him to be available for all of the conversations. 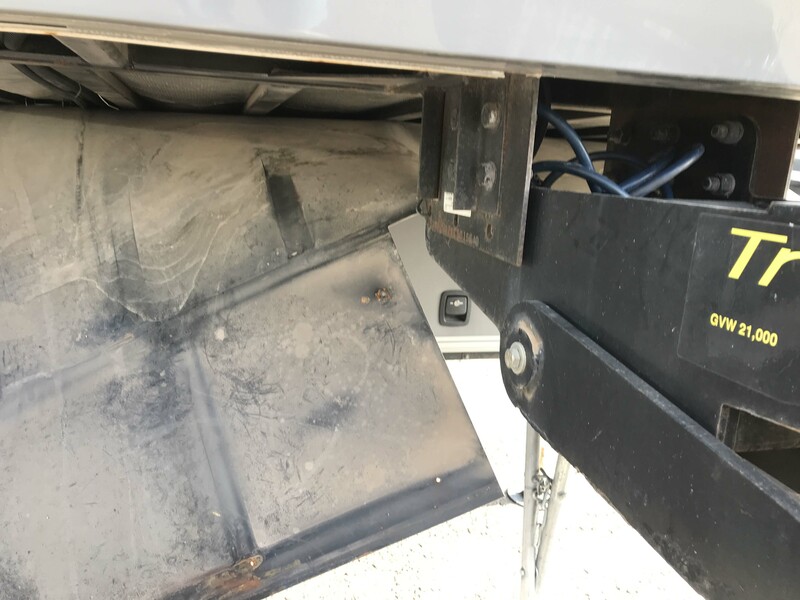 We knew this could be a huge job, because we had seen the work that our friends Howard and Linda had done on their fifth wheel. Ultimately their entire front slide had to be taken apart and all of the metal reinforced. We even went back and reread their blog posts to have a firm handle on what we could be getting into. The problem is you can’t really tell without taking apart the skin. In our case we wanted to be sure that we were already at a reputable company before tearing it apart. Lee did a ton of research and ultimately settled on Premiere Coachworks and Autobody Shop. He spoke to Carl at length about our particular situation. 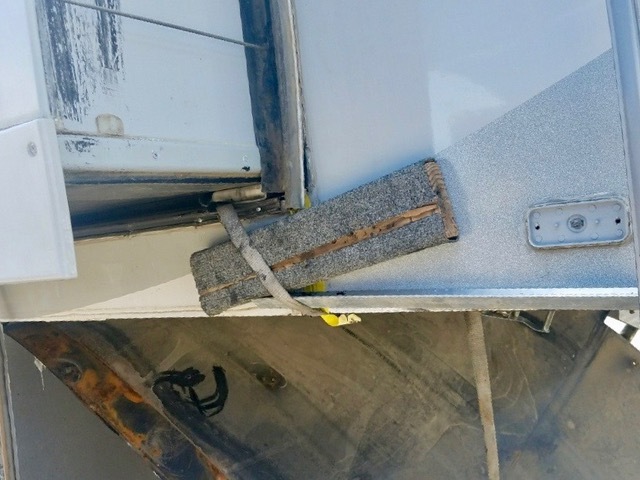 Unlike other RV repair work we knew we would not be able to stay in our rig. At the time we were assuming an expensive hotel stay and obviously wanted to keep the repair time frame very short. Ultimately a friend made a generous offer and we had a free place to stay for up to two weeks, which gave us some more breathing room. Carl told us over the phone he could not give any kind of an estimate until they could see inside and was even honest about the fact there was a small chance the rig might need to be totaled. Lee liked what he heard and made an appointment for Monday at noon. One of the most stressful parts of the whole thing was figuring out what to pack. We needed to pack in advance and had no idea how long we would be gone. When arrived at the location we were a little early, and unfortunately we were blocking the entrance when we pulled in. We went inside to the office and they got us sorted out pretty quickly and Lee pulled up the RV so they could take a look. 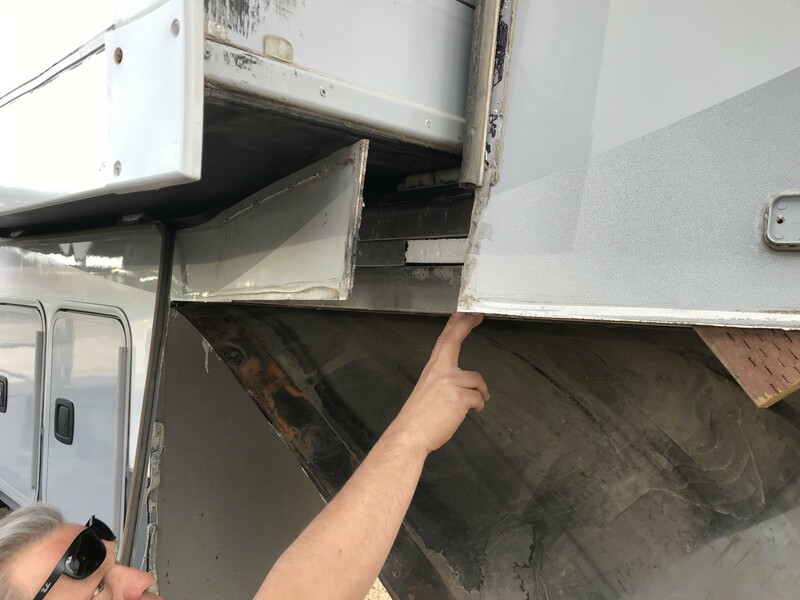 The technician had the same problem we had, and although he knew something was wrong they couldn’t be specific as to what without doing some tearing down to get a look. It could be anything from the frame just flexing to a broken frame, and the only way to know was to open it up. At that point I wanted to talk to our warranty company and Carl wisely suggested we all have a call with them together. Jack and I went inside the office to tell them we were there. The company works pretty frequently with insurance companies, but warranty companies will rarely pay for walls. I had my contract in hand though that stated, “metal frame, brackets, and weld” was covered. 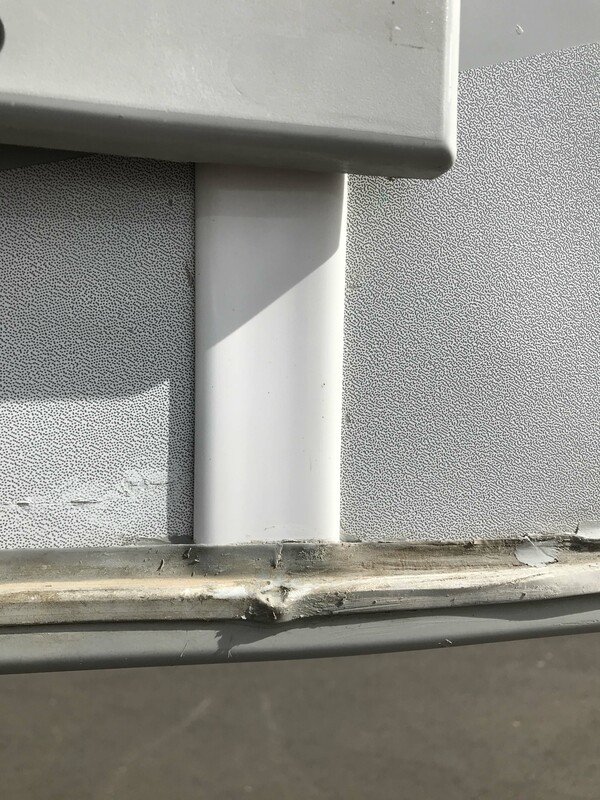 There was also a section that stated, “a covered wear and tear breakdown will be deemed to occur when a component fails to perform its function as it was originally designed to work..” In my mind it was clearly the metal frame and clearly wear and tear as I knew we had never had an accident. When we got the claims adjuster on the phone, he had a different idea. 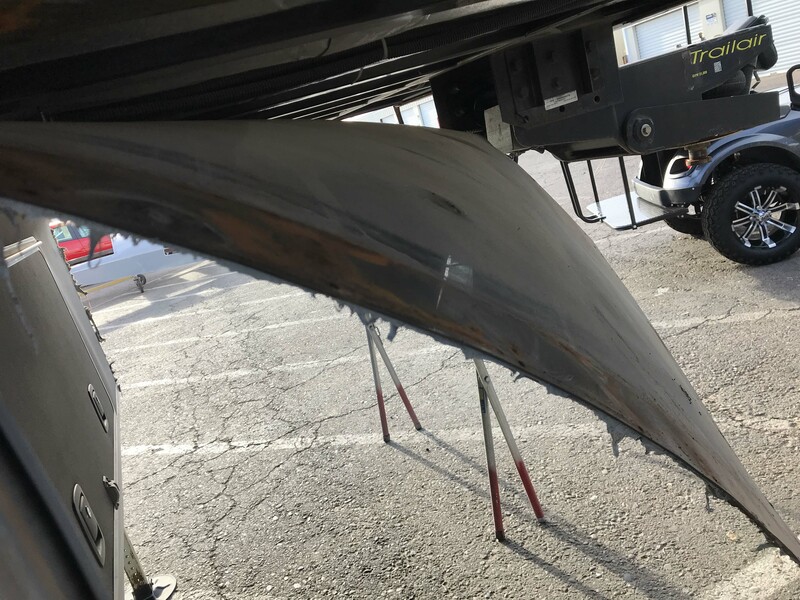 He referred me to the section of exclusions that states and exclusion for,”body structure…delamination…fiberglass panels..” At this point I pushed back. I specifically remember asking the salesman who sold me this $4K Platinum coverage warranty if the metal frame was included and being told yes. Turns out the metal frame is the base only and does not refer to the aluminum frames in the wall. This is a basic RV frame, or chassis. The vertical pieces (like studs in a house) are not part of the frame, and while the frame is steel, the “studs” are aluminum. 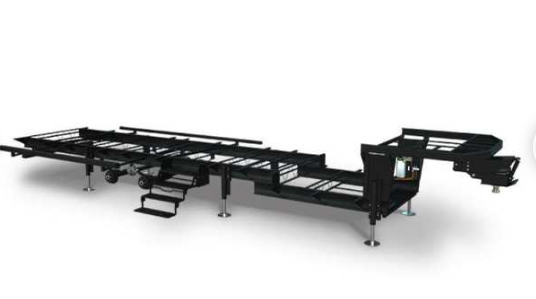 This is the construction cutaway from the factory for our model. As you can see they specific the base frame as being made of steel they say nothing at all about the aluminum walls, which is weird right? The warranty person wasn’t budging and refused to open a claim until he had proof that the base metal frame was cracked. That didn’t mean they would pay the claim, just that they would open one. 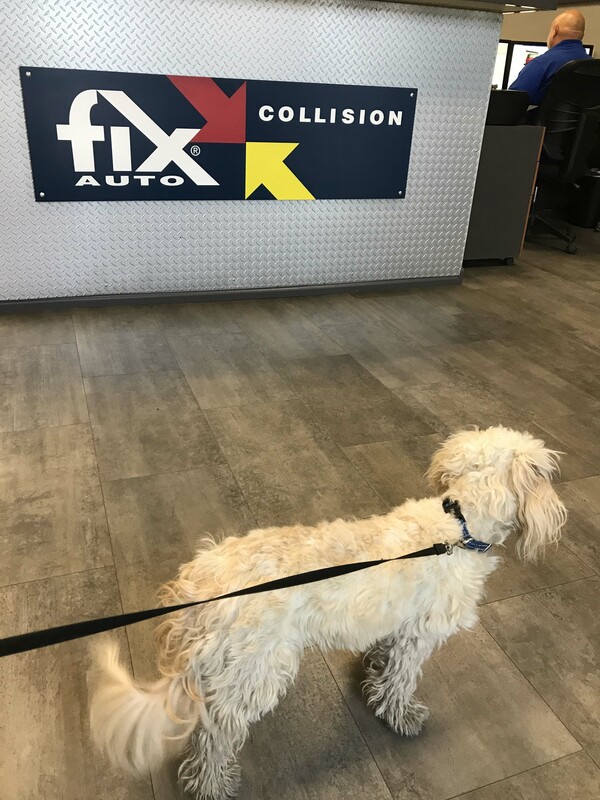 Since the only way to find out was to peel back the skin, Lee and I authorized four hours of work at $110 an hour to diagnose the problem We had talked about money before ever pulling into the lot and knew what our top end dollar amount was. Since Carl and his tech spent time walking us through what could be wrong and what their process was to diagnose, we both felt comfortable. I especially liked the fact that Carl repeatedly said they would not be able to tell if anything was wrong in areas they could not see. We did ask to be brought back as soon as they diagnosed the problem so we could talk about next steps in person. If it was going to cost $500 to see the problem I wanted to see it with my own eyes. Around 4pm we called and they said we could come in and take a look. The good news was the metal frame that they could see looked fine. The bad news was the aluminum wall piece had separated from the frame. 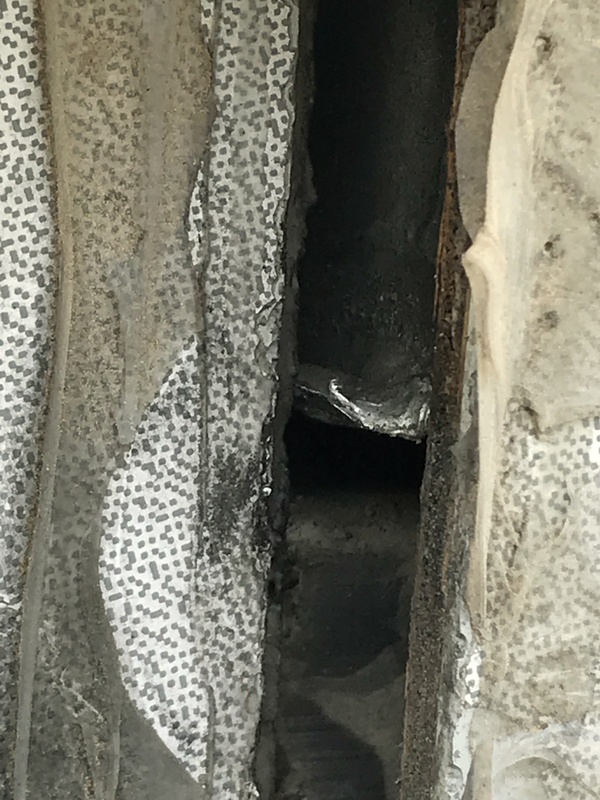 When we asked what could cause it he said any number of things including opening and shutting the slide, rattling from the road, or just normal stresses on the rig. They are designed to flex with stress and Carl really emphasized how common these type of incidents were. They had to pull off the bulkhead off to see what was going on. Lee looking at the break between aluminum and metal frame. This was the best picture I could get of it. I circled the separation. It doesn’t look like much but when it pushed out it caused the separation in the wall panel. 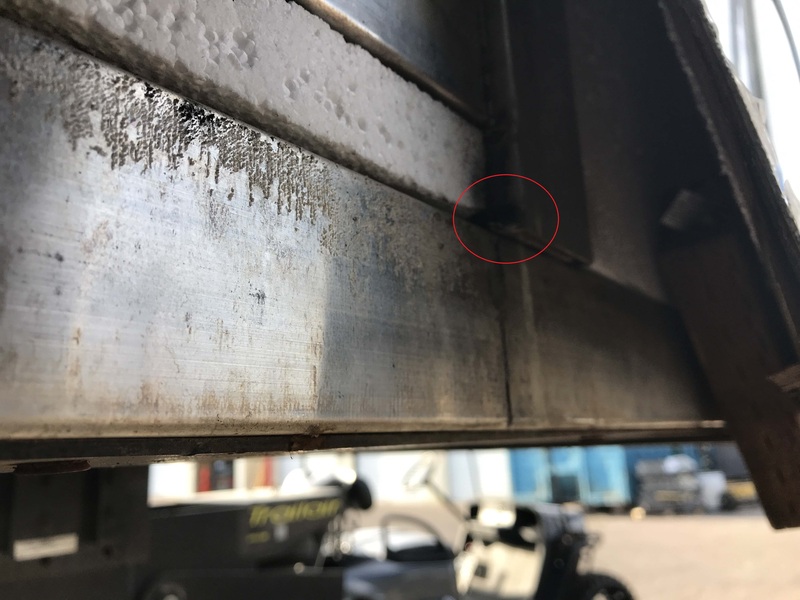 The vertical piece if the “stud” and you can see where it’s only spot welded and has come away from the larger horizontal piece below. Thankfully the metal frame looked really good. They were particularly concerned about around the hitch but that looked fine. At that point they were able to talk through our options. They could leave the break, and just fix the outer “skin”. They could weld the break and use industrial strength glue on it and fix the skin. Or they could start replacing pieces. That would of course be the most costly option, because they would need to “rebuild the rig.” Unfortunately to replace the aluminum pieces they would need to gut the interior, which is why that option is so time consuming and costly. And even if they did that they couldn’t guarantee it wouldn’t happen again. 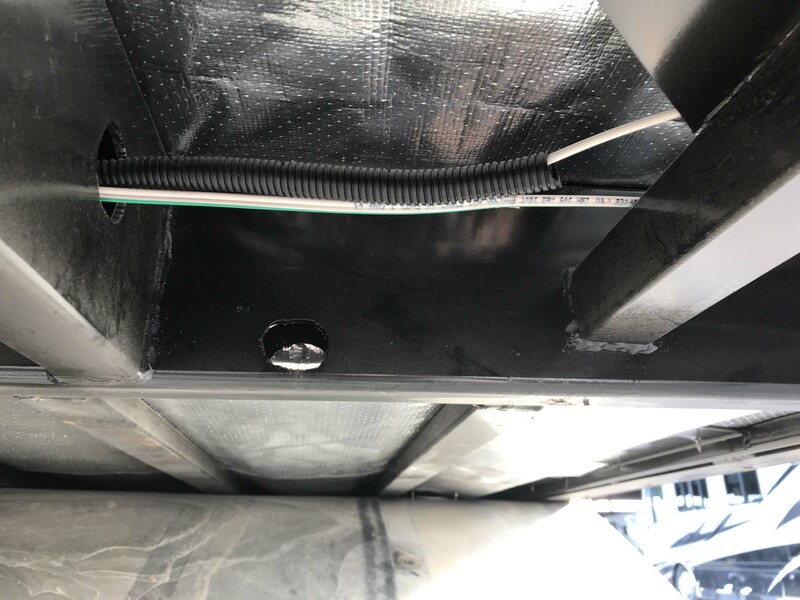 The middle option of a weld and glue would take about three days and cost $1700 (this price included the original $500 we spent) so we decided to go with that one. Personally I breathed a huge sigh of relief that it was not catastrophic failure. 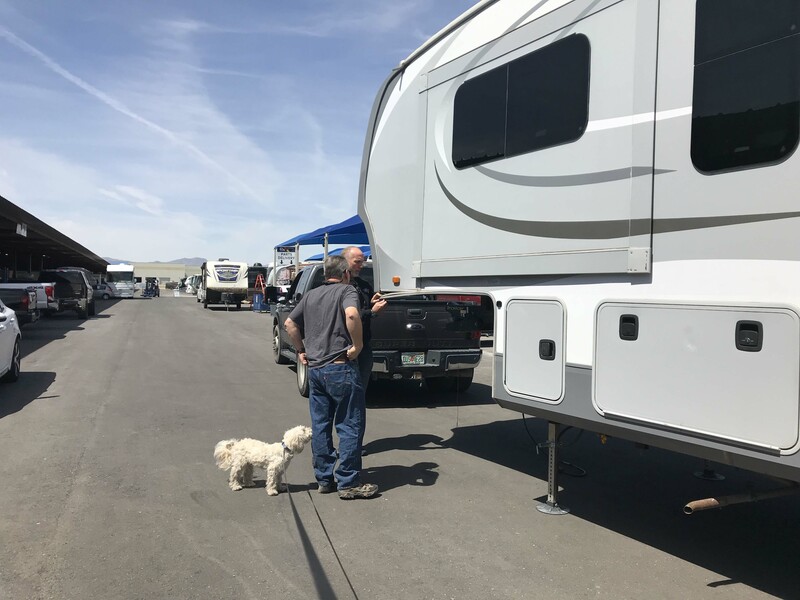 It was clear to both of us that these stress fractures were going to be an ongoing issue, and this was made even more clear when he showed us some other RV’s on the lot. There were a couple that were torn apart and we could clearly see the aluminum frames. 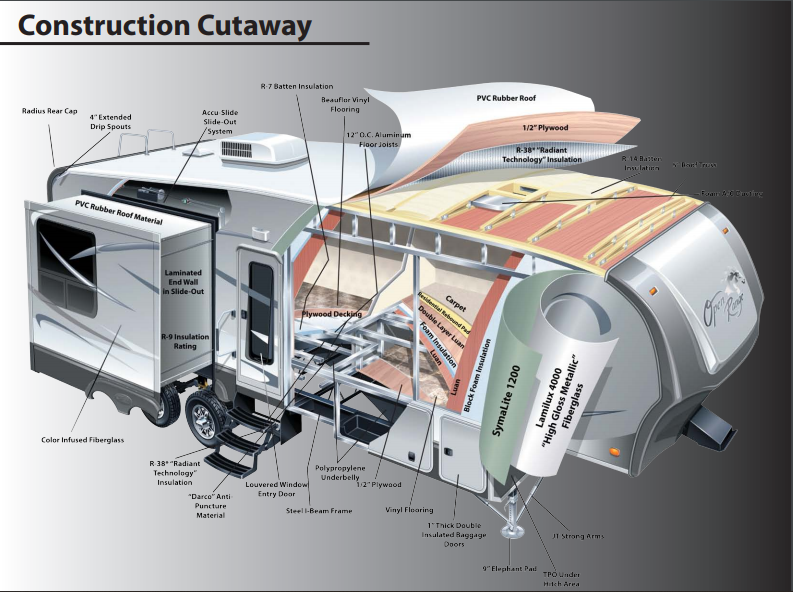 Most RV’s simply aren’t built for what we put them through, and seeing several that were being rebuilt really drove that home. Carl also spent quite a bit of time talking us through how to keep up on the cracks in the skin. 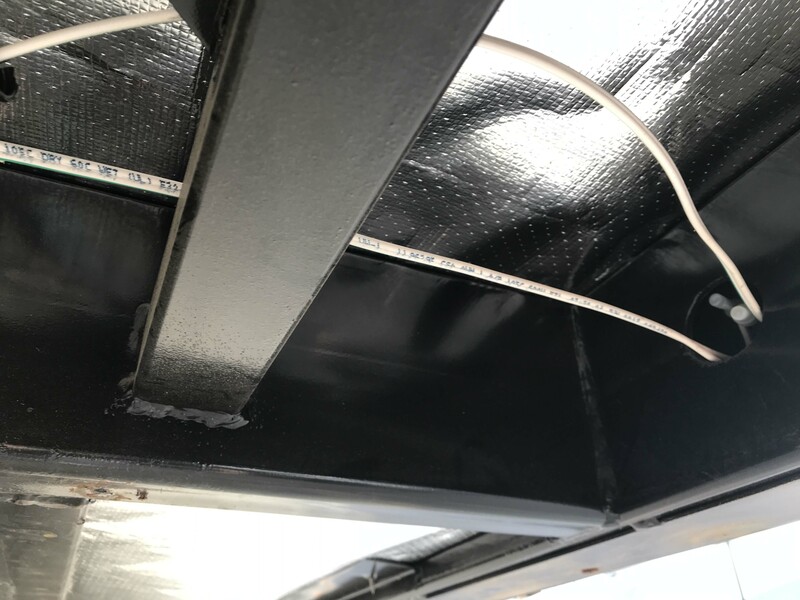 It was very important that we consistently inspected them and kept them caulked to keep water from getting in to the frame. We are certainly not alone in having some cracks in the outer skin, but as long as we treat them and make sure we keep an eye on them it shouldn’t be a major issue. The number one focus is keeping any water incursion out. His honesty really was refreshing and like I said I felt better. It’s a home on wheels and this is a natural consequence of traveling with it, which is what we intend to do. I didn’t even bother with going back to the insurance company at that point, because I didn’t want the delay. From my earlier conversation I knew they would fight the repair, so we just went ahead and signed for it. They promised to take some pictures of the repair and call us when it was done. Unfortunately the pictures we received aren’t that good. They were unable to get any good pictures of the inside work, but did show and exterior shot of when the work was being done. Exterior when they were holding it together after the weld and glue. The finished product looked good as new, which is the white trim piece. the grey trim piece needs to be replaced, and Lee’s summer project is resealing every seal on the rig. I don’t really know what else to say. On the one hand, it wasn’t the catastrophic failure I was so worried about. On the other hand, I have no confidence that something similar wont happen again, eventually. I will say that I was very pleased with how we were treated at Premiere Coachworks and would absolutely recommend them. They obviously knew what they were doing and I REALLY appreciated their honesty. Would it have been nice to be told that the problem was fixed and would never happen again?…sure. But that isn’t realistic, and if there is one thing we have learned in this lifestyle is it is better to face its challenges head on. Make purchases via our Amazon website links. There is no additional cost to you, and a portion of the proceeds help support our blog. Search Amazon.com here . Purchase the ebook telling the story of how we became full-time RVers. Purchase our recipe book filled with 80 recipes we have cooked in our RV and taste tested by Lee himself. You can purchase the kindle or paperback version on Amazon or buy the Apple version on Itunes.